The Department of Biological Sciences is dedicated to providing meaningful research opportunities to its talented undergraduates. Research centers for electron and light microscopy, mass spectrometry, and nuclear magnetic resonance spectroscopy and labs specializing in varied topics including gene regulation, neurobiology, laser spectroscopy, and plant molecular biology give students the opportunity to work in actual research programs while being mentored by young, enthusiastic, and dedicated faculty. The Office of Undergraduate Research provides information on the many research opportunities provided by UMBC. Please check out their website. 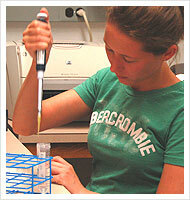 They also have an extensive list of summer undergraduate research opportunities for undergraduates. Additionally, each summer 40-50 students present their research at the Annual UMBC Summer Undergraduate Research Fest held in August and at the Undergraduate Research and Creative Achievement Day (URCAD). Interdisciplinary Training for Undergraduates in Biology and Mathematics (UBM), funded by the National Science Foundation. Other opportunities for undergraduate research at UMBC include the Summer Program in Computational Biology (SPCB); HHMI Scholars Program; the Human Computer Interaction Program REU, and the Undergraduate Research Award.